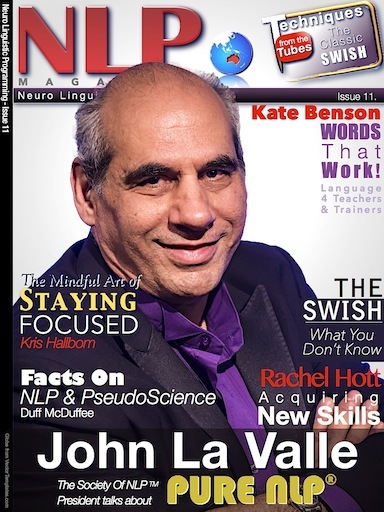 * JOHN LA VALLE , President of the Society Of NLP(tm) talks about PURE NLP®, and shares what lies at the core of NLP effectiveness. * KRIS HALLBOM shows us how using a mindful focus can help deliver those longer-term cherished goals. * KATE BENSON gives us some great practical options on choosing and using Words That Work in Teaching and Training… and anywhere you might find these useful. 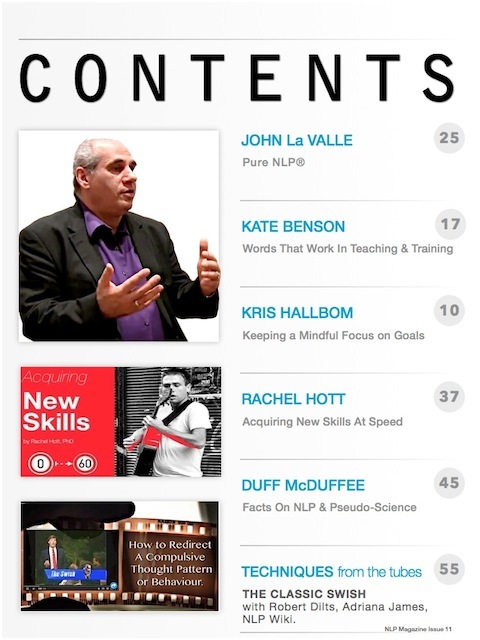 * RACHEL HOTT PH.D. from the NLP Center of New York explains this handy Model For Acquiring Skills Fast! 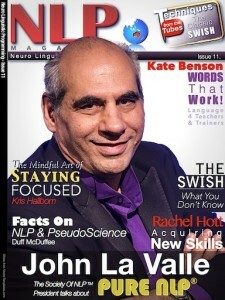 * DUFF MCDUFFEE makes some interesting points and shares some definitive Facts on Pseudo-Science and looks at possible (and impossible) associations with Neuro-Linguistic Programming. * ROBERT DILTS, JUDITH DE LOZIER, DR. ADRIANA JAMES and input from the NLPwiki combine to dissect and reveal the powerful and versatile SWISH process… Including What You Didn’t know about The Swish Pattern and more.